Living in South Africa one is spoilt by all the lovely placesand prime holiday destinations there are to visit along our coastlines. One of these places is the Storms River mouth which is situated on the southern coast of South Africa about 600 kilometres from Cape Town. The river runs through some sheer gorges and rapids before entering the sea in the Storms River Nature Reserve . Indigenous forests line the banks of the river on its way to the sea. To gain access to the river mouth one has to enter the Nature Reserve which is approximately eight kilometres from the N2 highway. Once in the reserve one has to drive down a steep winding road to the rocky coastline far below. Here a camp site for caravans and tents has been laid out and there are also some wooden oceanettes (bungaloes) for those who want a more comfortable stay. The road ends at a rocky point where a restaurant has been established and where one can enjoy a light meal before setting off along the trail to the river mouth. Parking is available near the restaurant for day visitors. 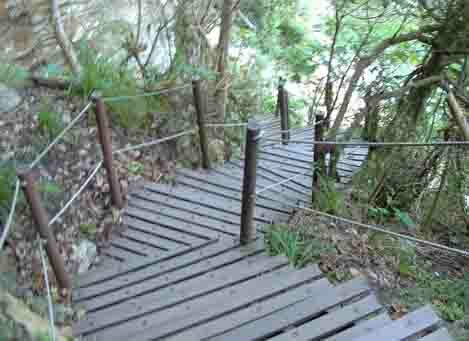 The trail to the mouth consists of a wooden walk way which is about a kilometre long and winds its way through the forests which cling to the steep hillsides in the vicinity of the mouth. The walk is much easier these days than it was twenty years ago when one had to cling to branches of trees in the forest to stop falling down the steep embankments. The almost vertical staircase at the end of the walk. A word of warning however! This walk although not overly strenuous has about 350 stairs along its course and as you have to follow the same pathway back you climb up and down 700 stairs while on the trail. Luckily most of the stairs are the riverside of the trail so most people can enjoy the walk. There is plenty to see on the trail especially the glimpses of the sea through the forest umbrella . Along the way there are a number of caves, a lovely little waterfall and an almost vertical staircase to clamber down to reach the suspension bridge that crosses the river. Many people are afraid to cross the bridge as it sways a bit when walking over it but if you hold on there is nothing to worry about even if you should slip and fall. On the far side of the bridge is a steep hill and a short trail to a fantastic vantage point that overlooks the whole of the mouth and the restaurant complex at the car park. Near the mouth is a large cave which was once used by the Strandlopers for shelter. It's about forty metres deep and very dark and eerie. Even a flash on a camera does not light up the darker regions of the cave. 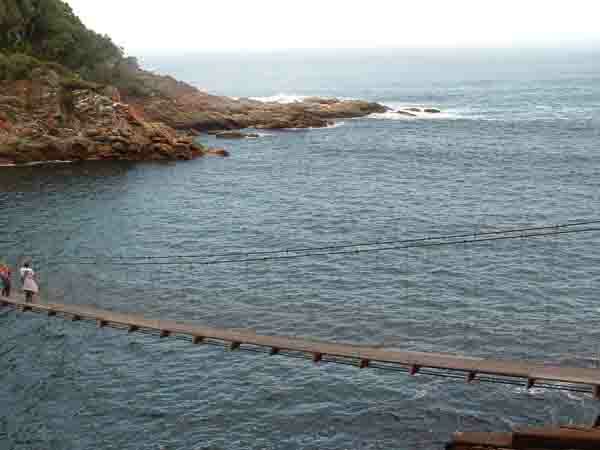 Walking in the Storms River area is one of the major pastimes of people who visit the mouth. A number of trails start near the car park in the reserve. The most well known is the Otter Trail which winds its way along the rugged coastline towards the west, crosses a number of rivers and finally ends near Natures Valley after a three day hike. This trail is not for the unfit and is so popular that a hike along it has to be booked months in advance. Of course a highlight of any visit to the mouth especially in summer is a swim in the warm Indian Ocean out to the raft anchored a short way off the minute little beach. For those who are more adventurous there is also an underwater trail where people can follow a guide who will show you some of the sea life that abounds in the ocean on this part of the coastline. 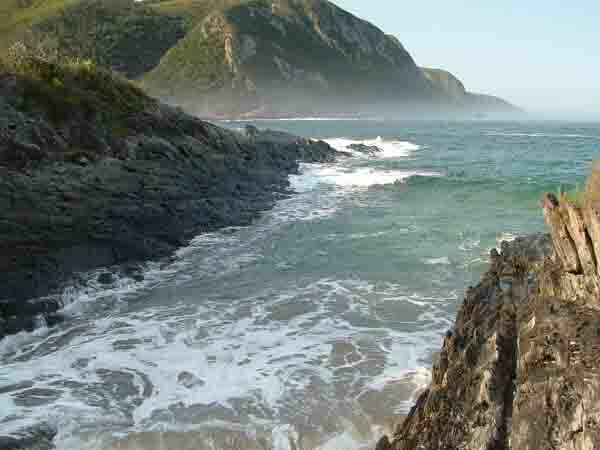 A visit to the Storms River mouth is well worth the entrance fee it costs you to enter the Nature Reserve. 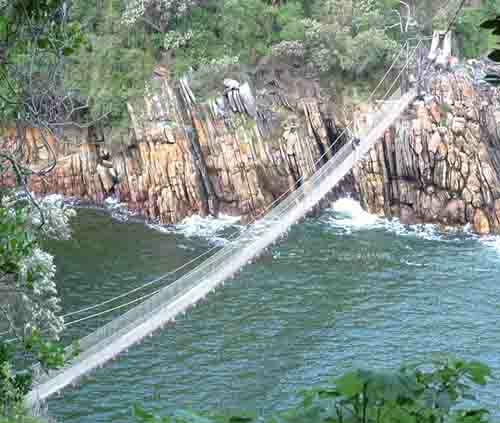 Visit it next time you are in the Tsitsikamma area.